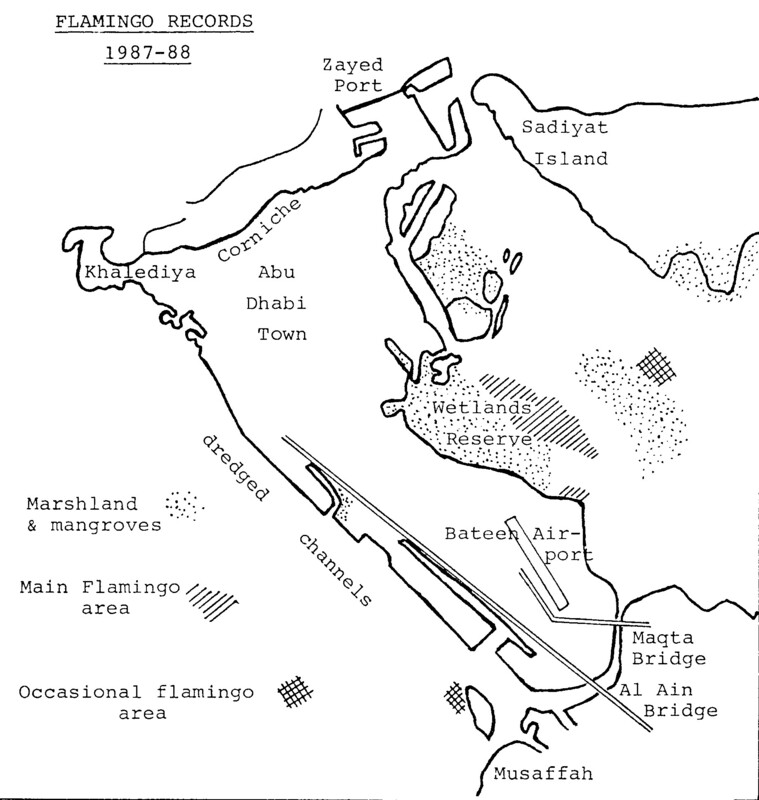 In Bulletin No.34 it was mentioned that the flamingoes left the Abu Dhabi area in August, 1987. However, they returned about two months later, when a group of 35 birds was seen east of the Wetlands Reserve. Five days later I counted more than 60 birds and on 18th October their number had increased to about 120. On 30th October 1987 there must have been around 300 flamingoes, more or less divided into three main flocks, two smaller ones of some 50 birds each and a third one containing the remainder. 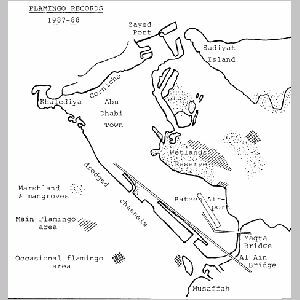 Flamingoes then over wintered in the immediate area until 19th February, 1988, after which they disappeared for a few days. However, on 24th a group of 40 were seen feeding, while others were arriving from an easterly direction at around 0900 hours. During the last week of April 60 to 70 flamingoes were seen feeding near the Wetlands Reserve. After 18th May these were gone but on 21st 6 birds had returned to the same area and remained for two days. On the last day of May 16 flamingoes returned. My method of estimating such rather large numbers of birds is to count accurately an area of 50 birds and then calculate how many times this will fit into the total flamingo flock area, with some allowance being made for density. Therefore I am certain that on 30th October, 1987 there were at least 200 and an unlikely maximum of 400 birds. All these observations were made while piloting a helicopter and you have about 30 seconds to do your calculating, while over flying. It is interesting that flamingoes and other birds in the area east of the Wetlands Reserve are apparently not disturbed by helicopter traffic at low altitudes. This is not the case at other places, where small numbers of flamingoes (less than 20) can be seen for one or two days perhaps twice a year. 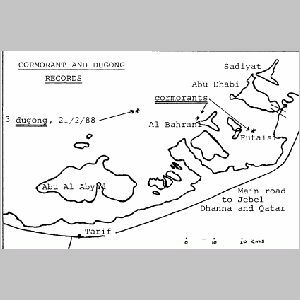 These locations are the south coast of Al Bahrani Island and at a dredged island site two kms north-west of the Musaffah industrial area. Until now I have not noticed any visual effects of dredging operations on the area to the east of the Wetlands Reserve. When dredging commenced in 1987 for a land-fill some 500 metres to the east of the Bateen Airport runway, clear water was returned to the area and flamingoes and other waders could be seen feeding. There was a medium-sized flock of cormorants to the south-east of Futaisi Island from November 1987 to mid-February 1988. Other pilots' estimates are from several hundred to a few thousand. This flock was last recorded for two days on the western tip of Al Bahrani Island on 23rd February, 1988. Through the month of May 1988 a medium-sized flock could be seen on Qarnain Island, near Das. Other pilots have noticed them and it appears that they leave the island in the morning between 10 and 11 o'clock. Since there are no afternoon flights in the area, it is not known at what time the cormorants return to this island. Occasionally single birds are observed drying out on rocks and beaches around Das Island in the summer months but it is rare to see more than three birds together at that time of the year. On 9th April, 1988, after the heavy rains and strong winds in the Abu Dhabi area, several birds were seen (resting?) at the Total ABK Platform, which is some 90 miles to the north-west of Abu Dhabi. There were two hoopoes, one hawk, one desert wheatear (male) and three undetermined pigeons. As on other occasions all these birds had disappeared the following day. It is not at all rare to see birds at offshore locations after a period of strong winds. You might even see some insects. For instance in November of last year I saw a red dragonfly in the Bunduq oilfield, which is halfway between Das and Arzana Island; while on Das itself dragonflies are conspicuous at times throughout the year. Several helicopter pilots have been reporting tremendous numbers of jellyfish. It seems to be a seasonal occurence in Gulf waters. It starts in the middle of April and ends at the end of May. On 1st May, 1988 I counted some 35 large groups on a flight to Bunduq, but at the same time they are also numerous at many other locations. I do not know their name. They have a shape like a cup and saucer, attached to each other by four rings. The moving part is the saucer with a diameter of up to 20 cms. The diameter of each ring is about 2 cms. The area that a group covers can be several hundred feet long. Its width is about one fourth of its length. The jellyfish are so densely packed together that the whole shoal has a light blue colour, which makes it highly visible. From the middle of November 1987 a flock of curlews was seen daily at Bateen Airport. At the beginning they numbered 17, with 14 remaining on the last recording date of 16th May, .1988. 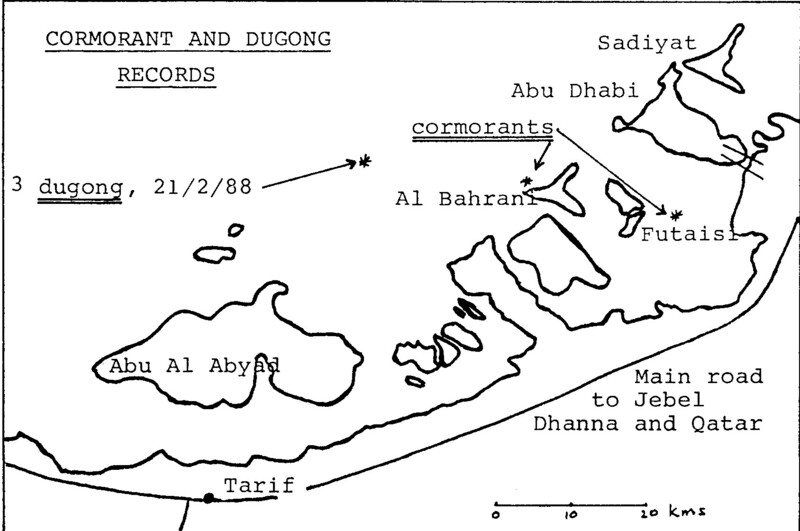 It was extremely pleasing to record dugongs once again, three of them 25 miles due west of Abu Dhabi on 21st February, 1988. My previous last recording of these elusive sea mammals was on 4th April, 1986.